Chrysler–Simca 1307/Chrysler–Simca 1308/Chrysler–Simca 1309/Chrysler Alpine/Chrysler 150/Talbot–Simca 1307/Talbot–Simca 1308/Talbot–Simca 1309. 1975–9 (prod. 487,967 between 1976 and 1979, France only; 185,827, incl. Talbot, in UK). 5-door saloon. F/F, 1294, 1442, 1592 cm³ (I4 OHV). European Car of the Year 1975–6. Handsome, contemporary liftback based on older Simca technology (1100 floorpan, scaled up) but looking very mid-1970s thanks to Roy Axe-designed body. Dual manufacture in France and UK, known as Chrysler Alpine there and in British Commonwealth countries. UK models not known for good build quality. Called Chrysler 150 in Spain. Chrysler badge even on Simcas, so advertised as Chrysler–Simcas usually. Name change in Europe for 1979 as Peugeot took over Chrysler Europe, though these cars wore Talbot on the bonnet and the Chrysler pentastar in the grille. 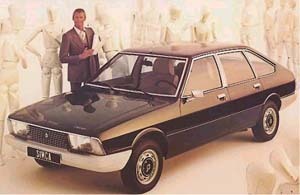 Engine sizes too small to be competitive against Cortina in UK, even with 1·6 for 1979, and considered a step below Renault 16. Reverse-rake grille served as inspiration for Renault Éspace I’s front end.